As many of you know, Neumann is beautiful piece of property with an abundance of native deciduous trees. Over the past 15 years we have removed hundreds of trees. Almost every one of them was removed for the safety of our golfers and our staff. Most of them (150), were poplar trees which were planted along the fairways in the late 70’s and 80’s with an intended life span of about 25 – 30 years. Over the past few years we have once again, spent the majority of our winter work on tree removal, but this time it is the native Ash tree that is the victim. 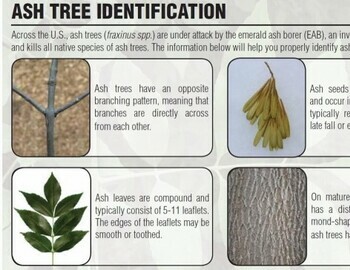 Ash trees across the region are dying and Neumann is no exception. The destruction and rapid death has been worse than most arborist predicted 10 years ago. These Ash trees were a part of Neumann’s landscape since its inception and it is heartbreaking to think they will all be gone. The trees will not only be missed from a playability aspect, but aesthetically too. This year we have removed 30 dead trees which were deemed unsafe to have on the course. We anticipate another 15 will be removed in house this winter as we continue our fight keep up with these dying trees. The good news is we still have over 1,000 thriving native trees on site. They will continue to provide the scenic wooded landscape that Neumann has always been remembered for. Hopefully, this gives you a little understanding of why trees are coming down here at Neumann. We surely do not want to remove any tree unless it is necessary.